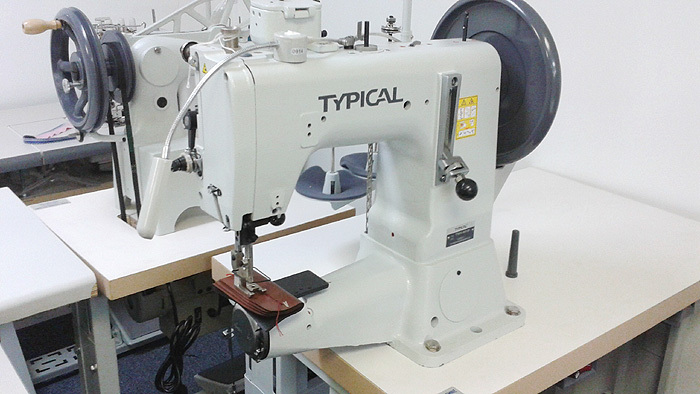 The TYPICAL TW3-441S is a heavy duty, short cylinder arm walking foot sewing machine. TYPICAL TW3-441 extra heavy duty compound feed/walking foot machine with cylinder arm and large barrel type shuttle capable of sewing with heavy threads. The machine has a large capacity bobbin and adjustable reverse feed machanism. The presser foot can be lifted by lever or by foot pedal. Maximum foot lift height is 27mm. Common applications for this machine are holsters, harnesses and medium to extra heavy leather as well as webbing, cargo straps etc. Machine stitching thickness is from 1/16" to 3/4". ∙ Balance wheel 155 mm eff. Dia.